You're a cyclist - good for you! You're getting exercise, conserving energy, and reducing traffic. And what thanks do you get for it? Waiting an eternity at stoplights because your little bike doesn't trip the car sensor, so it thinks nobody's there. Grr. Turns out, there's a fix for that - it's not exactly elegant, but it works, and it's well-documented and patented. 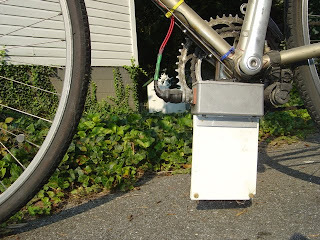 That's it in the image - well, part of it, the rest of the electronics are up by the handlebars. It's definitely a workaround for a poorly-designed system - the real design fault lies with those who engineered the car sensors without considering cyclists. Moral of the story: it's tough to do the right thing in a world designed to help people do the wrong thing!